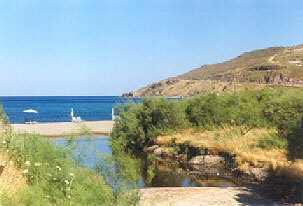 Lesvos, Lesbos, Mytilini, Mitilini, Mytiline, Northern Aegean Islands, Holidays in Greece, the Greek Travel source. Greece's third largest island after Kriti and Evia, was a center of the Aeolian civilization, when around the 10th century B.C. it spread to the shores of Asia Minor. During the reign of the tyrant Pittakos (6th century B.C.) - one of the Seven Sages of Antiquity - Sappho and Alcaeus, two of the greatest poets of the ancient world, immortalized the island in their poetry. It has also been the birthplace of the guitarist Arion and the musician Terpandros. In the 5th century B.C., Lesvos joined the Athenian League but, like the other Greek states, succumbed to Macedonia in the following century. In 88 B.C., it was annexed to the Roman province of Asia Minor. In later years, it was ruled succesively by the Byzantines (1355), the Genoese (1462) and the Turks (1462-1912), while repeated pirate raids over the centuries caused the islanders to erect countless castles in self-defence. Its long, unbroken high standard of civilization is still in evidence; even in our own day many outstanding writers, artists and thinkers have their roots in Lesvos. The list is impressive: Stratos Eleftheriades (Teriade), scholar, publisher and art critic, the self taught naif painter Theophilos (Hadzimichail), novelists Argyris Eftaliotis and Stratis Myrivillis, poet Stratis Paschalis, who won the 1st prize of the Academy of Athens at the age of 35 (usually people get this award at the age of 70) and Greece's most famous contemporary poet, the Nobel laureate Odysseas Elytis. Lesvos is one of the few places in this country where most of its towns and villages have preserved intact their architectural herritage. Among its most remarkable treasures are the old olive presses, which for some years now are being restored and converted into cultural centers. 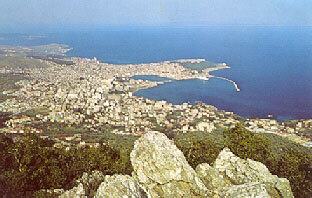 The deeply indented bays of Kalloni and Yera almost split the island into three parts, creating fertile valleys between them. The highest mountains are Lepetymnos (968m.) and Olympos (967m.). Most of the towns and villages were built in the interior for security reasons, in the dips and hollows of its undulating hills. 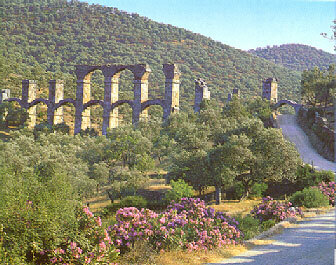 The landscape is astonishingly varied, with enormous olive groves - their 11 million trees produce a vast quantity of justly famous - pine - covered slopes interspersed with oak, chestnut and plane trees, rocky mountains, numerous beaches, some sandy, some pebbly, some with steam rising from them indicating the presence of hot springs, some - the ones facing the open sea - blessed with crystalline waters.